Nothing Ventured Games Fate Core It's Element-ary! It’s Element-ary! presents the heroes and villains from your favorite forgotten Saturday morning superhero cartoon. Three not-so-ordinary people, transformed by a deranged clown, form a team to protect their city from an eclectic collection of bad guys. 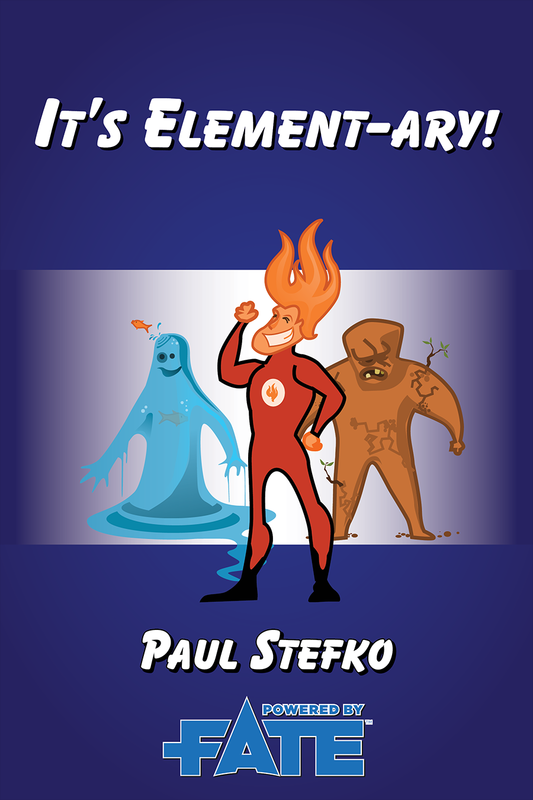 It’s Element-ary! uses the Fate Core system, including the rules for super powers originally found in Venture City Stories. Inside, you’ll find four heroes and five villains with complete stats including aspects, skills, stunts, and powers, along with various NPC mooks. Hot-Head, a circus performer infused with flame. Big Blue, a scientist transformed into water. Earthling, her husband turned into dirt and roots. Glob, their daughter, transformed before birth. Laffo the Clown, their nemesis. Robot Face, an AI bent on wiping out humanity. That Ninja, wanted thief with mysterious powers. Party Animal, a trickster in many forms. Fashionable Ghoul, an immortal grifter after the richest brains. Throughout, we also detail the series, its episodes, and the tone of Saturday morning cartoon action. Use the material in It’s Element-ary! as you find it or let it serve as inspiration for your own Saturday morning campaign. Click here for stand-up character cards for the four heroes.